Hello everyone! 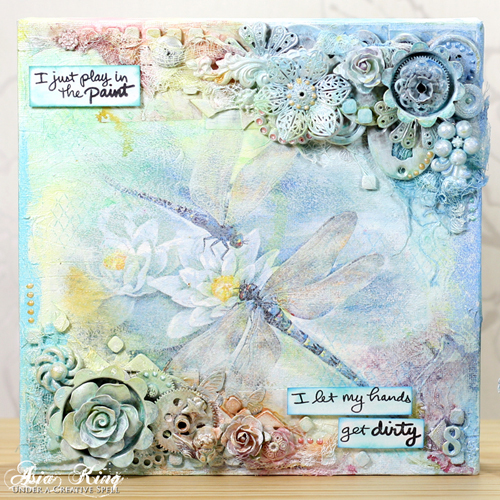 Asia King here and today I am sharing a project I created for Scrapbook Adhesives by 3L®’s booth at this year’s CHA, Mixed Media Dragonflies. My ensemble has got quite a lot going on so I will be sharing it in two parts. Today is the first one and for the next installment please pop back on January 28th :). 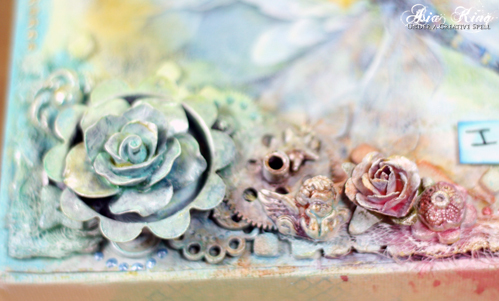 This project is a new take on the dry decoupage technique I shared in my mixed media altered vanity box back in May last year. I used my favourite dragonflies printed napkins – they have such a happy design and colour palette, don’t you think? After adhering the napkin to the canvas with Adhesive Sheets – 12×12″, I dry brushed some white gesso over the design to tone the colours down a bit. Then I created lots of different textures. I’m using Adhesive Dots Small, Adhesive Dots3D, Thin 3D Foam Squares, 3D Foam Squares , 3D Foam Pennants and about a million of buttons, random found objects and different metal, resin and fabric embellishments. Once everything was secured in place with my trusty Adhesive Dots Small and Adhesive Dots 3D I covered all elements with a generous dollop of white gesso and heat set it with my heat gun. Then I just played around with ink sprays and paints to add colour and shimmer. 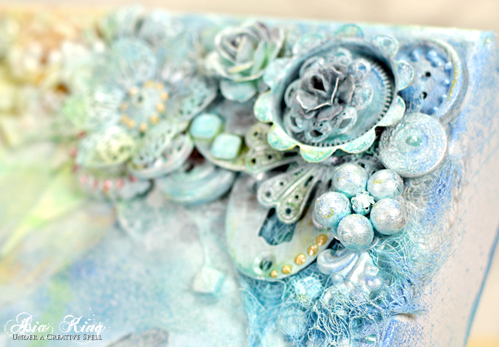 I also added some heat embossing with coordinating embossing powders for more texture. To complete the canvas I added some stamped journaling quotes mounted over Crafty Foam Tape White and some more detailing with Liquid Pearls. This entry was posted in 3D Foam Shapes, 3D Foam Squares, 3D Projects, Adhesive Dots & Lines, Adhesive Sheets, Adhesives, Canvas, Crafts & Tutorials, Crafty Foam Tape, Home Decor, Permanent Adhesive, Spring, Summer, Wear your Adhesive on the Outside and tagged 3D Foam Pennants, 3D Foam Squares Mix White, Adhesive Dots 3D, Adhesive Dots Small, Adhesive Sheets 12x12" (25 sheets), Adhesive Sheets 12x12" (5 sheets), Asia King, Canvas, Craft and Hobby Association (CHA), DecoArt, Home Decor, IMAGINE Crafts/Tsukineko, Mixed Media, Prima Marketing, Ranger Ink, Spring, Stampendous, Summer, Tattered Angels, Thin 3D Foam Squares White, Upcycling, Wear Your Adhesive on the Outside. Bookmark the permalink. 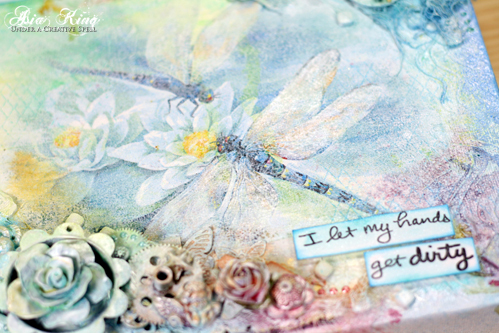 2 Responses to "Mixed Media Dragonflies With Adhesive Sheets – Part I"
What an elegant project the colors are just lovely and soft and I love all the layers especially the beautiful flowers! Thank you so much Deborah for your lovely comment!